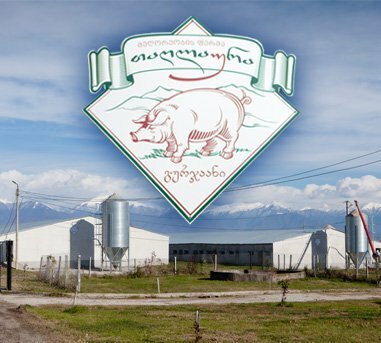 "PIG FARM Kakheti Farming Company"
Taghlaura pig farm is located in Kakheti region, 6km away from the city of Gurjaani, in the direction of Lagodekhi. The farm represents a ”fertilizer area”, so-called finisher, with productivity under the condition of simultaneous placement-3600-3300 fertilizer pigs of 105-120kg. The complex was created on the basis of a former milk farm which was built during Soviet period, it was put into operation in August of 2012. The farm is located at land plots of total area of 7 ha, and its infrastructure consists of 4 isolated from each other buildings with total area of 2600sq.m. with food warehouses, a slaughterhouse, an administrative block and a technical building. Besides that, the territory is divided into sanitary zones, it has droppings tanks and a 3600 sq.m. building which has additional area, where in future reproductive block for 500 sows will be located. 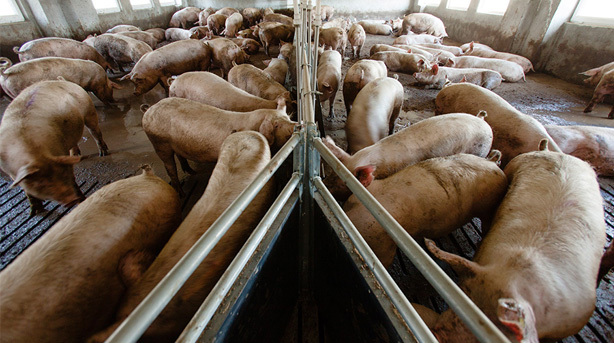 As a result, the productivity of the complex will become 11000 pigs annually. Ensures permanent circulation of air in the piggery section, its flow with optimal speed and delivery of cool air in hot summer days, as a result the most comfortable climate is created for fertilizer pigs, under the conditions of permanently renewable air. Enables efficient placement of the pigs and their control in view of their age or other factors. 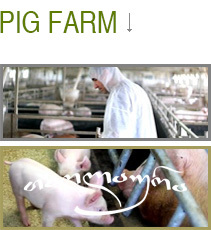 At the given stage of growth the pigs consume 7 liters of water and 3,2 kg of food during the day, for this purpose the sections are equipped with watering system out of which the animals receive clean drinking water, and the food is automatically supplied from special food lines, which consist from the main tanker, supply device, food bowls and food level controllers. Each piggery has 50 cm deep and 4 m width sewage collector, which is covered with reinforced concrete tiles of special form, where the droppings are gathered in the collectors, and then move to the droppings collector tanks. Part of the farm infrastructure are grain warehouses with total capacity of 1900 tons. 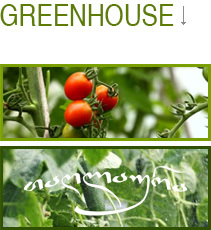 The warehouses are equipped with the system of active aeration of warehouses. 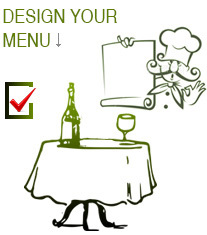 As to the food department, its productivity is 2,5 tons per hour. It consists of pneumonic peeling mill, 2 units 2 ton mixers, mechanism of dosing, loading conveyer and pneumonic carrier. The daily productivity of the existing object is 30 pigs. The slaughterhouse is divided into clean and dirty zones, also the recommendations submitted by the food safety service are envisaged, on the basis of which special closed lights were installed, the knives are permanently sterilized, the pig body is treated before placing into the refrigerator, namely, it is cut longitudinally along the backbone, by means of an electric saw. The so-called human method is used in the process of slaughter, that is the animal is stupefied by means of a special electric device, after which other procedures are performed, as a result there is no excess adrenalin in blood which has positive effect on the quality of blood. The slaughter also has a refrigerator where meat is refrigerated till the bone up to -2 degrees.